For quite some time there was not really much news on Himobo with new models, but now the Bochum based model manufacturer is fully back with impressive novelties. With the all-new asphalt cooker or the Langendorf Inloader Himobo presents totally new models; whose real machines have not been available much within the diecast model world – a perfect and successful restart. But the most thrilling news Himobo announced and presented late 2013. 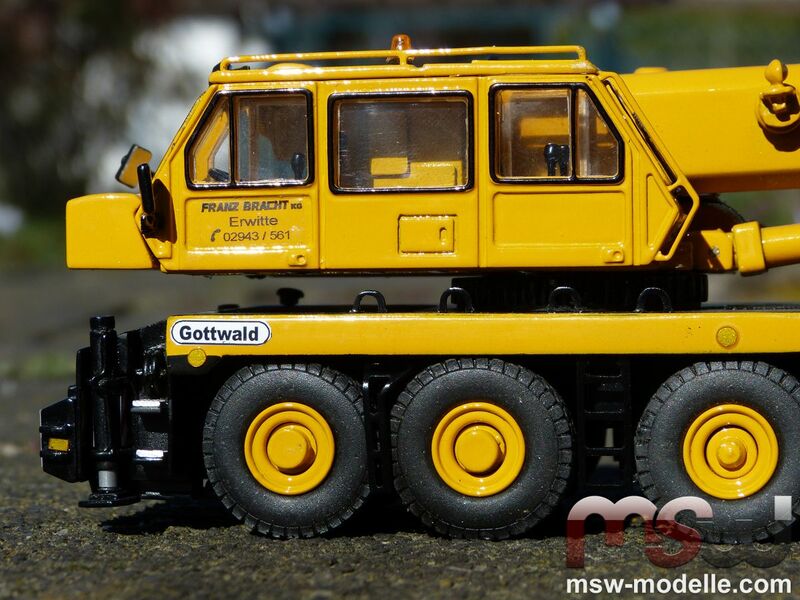 Gottwald cranes are still today really legendary; especially the popular Leo-crane range from the Eighties was unique with its typical twin operator cab. 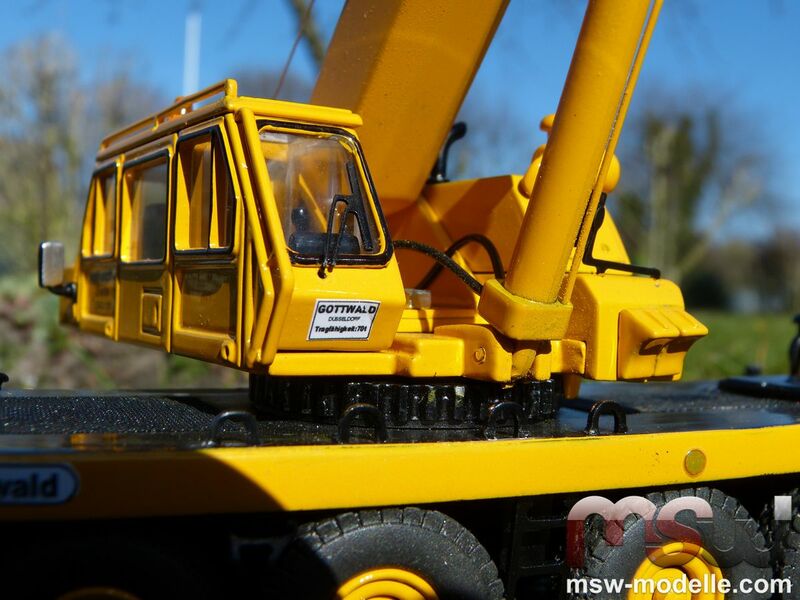 This crane range can be seen as the predecessor of today’s city cranes, as for example the Terex Demag AC40 or Liebherr LTC1045. 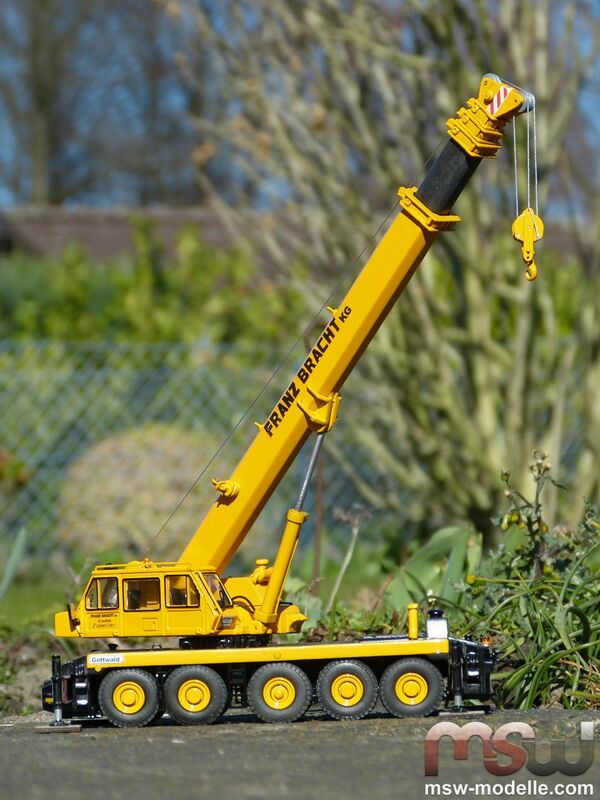 And with the AMK 71-52, a 70 t crane of this Leo range, Himobo is back successfully and impressively also with crane models. 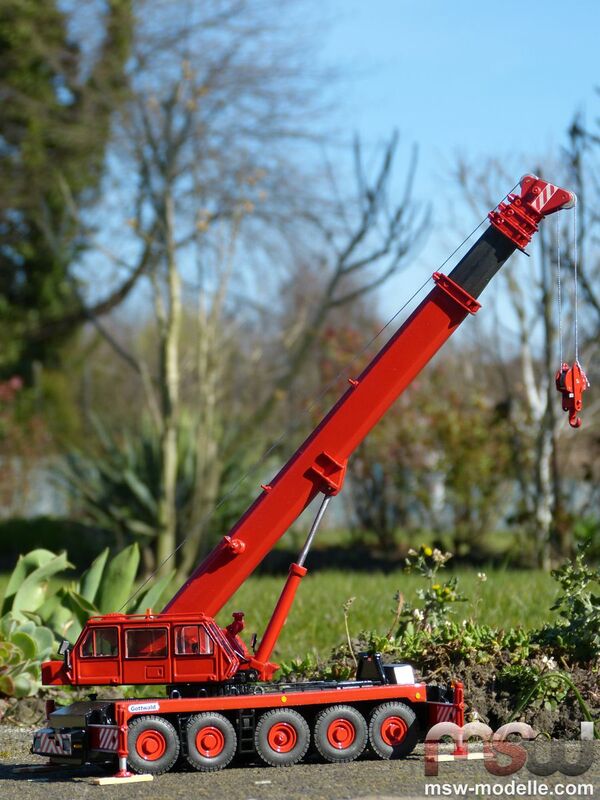 The AMK 71-52 is available in the livery of the Dortmund based crane rental company Mairitsch as well as in red/black. 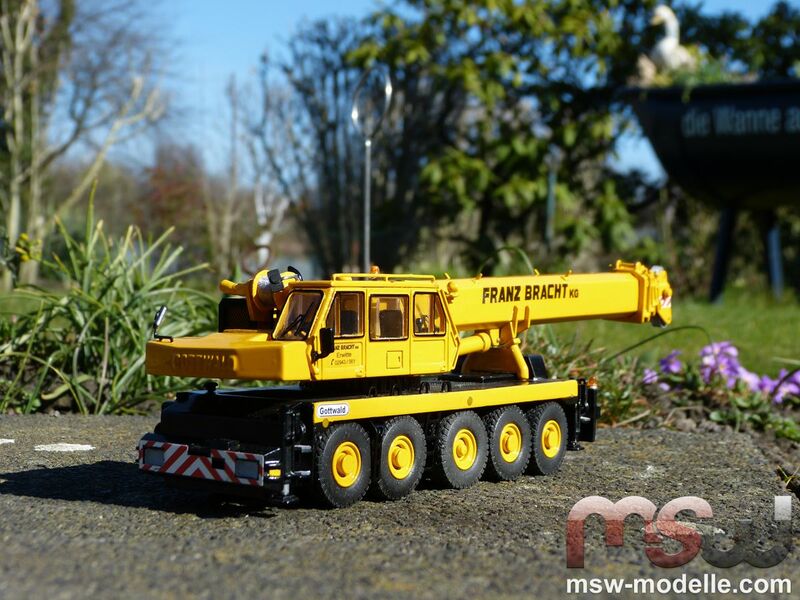 Exclusively made for MSW Modelle, the limited Franz Bracht livery is presented here. 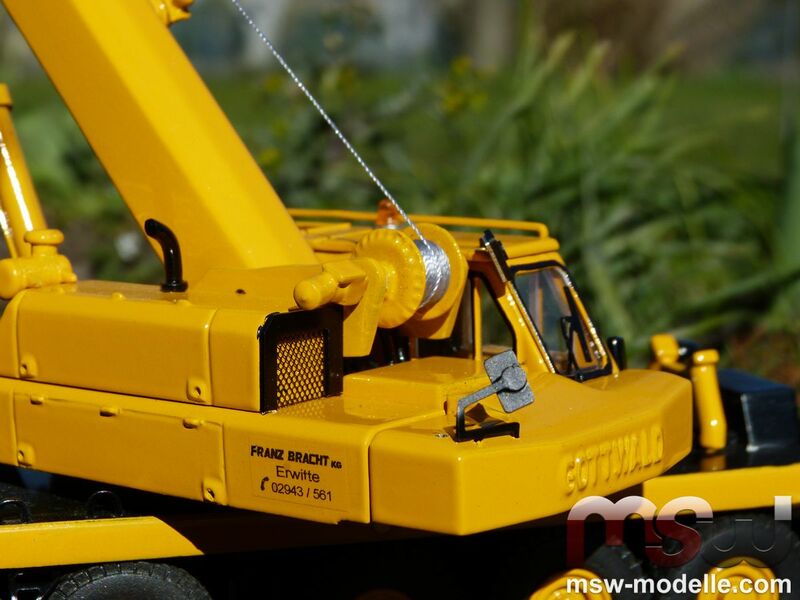 During the realization of this 70 t crane, many pictures and documentations were of great support as well as many interviews with an operator knowing the real crane perfectly. The white alloy as main material makes the model really massive and also heavy. All pulleys are manufactured of aluminum in single pieces and also rotate easily. Even the Gottwald typical silhouette of the main hook Himobo copied well, of course the hook can rotate. 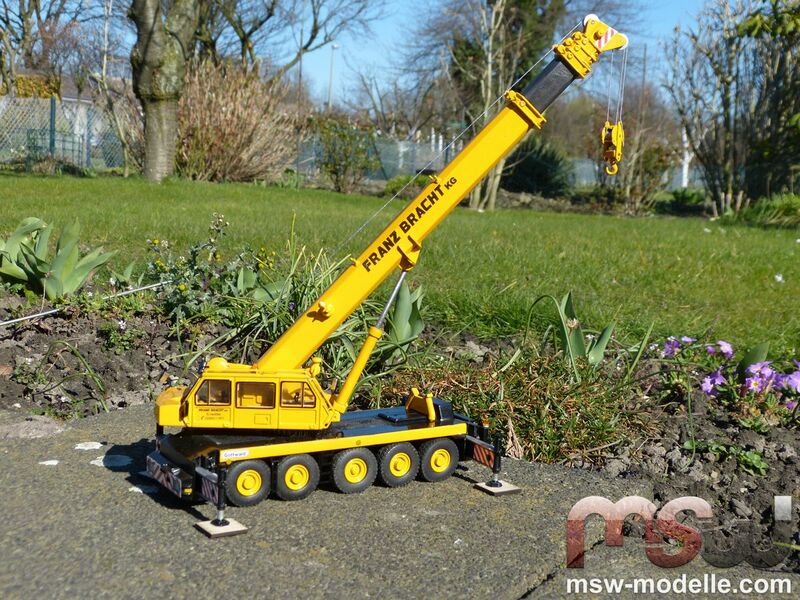 It comes with three single sheaves and would be approved for a maximum capacity of 40 t.
The crane travels on 5 axles, which are all to be steered. The steering angle is sufficient. Himobo also indicated the drive train on the bottom well. On the back of the undercarriage the engine cover with air filter is visible; a 257 kW Mercedes engine was installed on the crane. The engine cooler grid has been indicated also well. Warning signs can be found on the front and back together with indicated lightings and turn indicators. 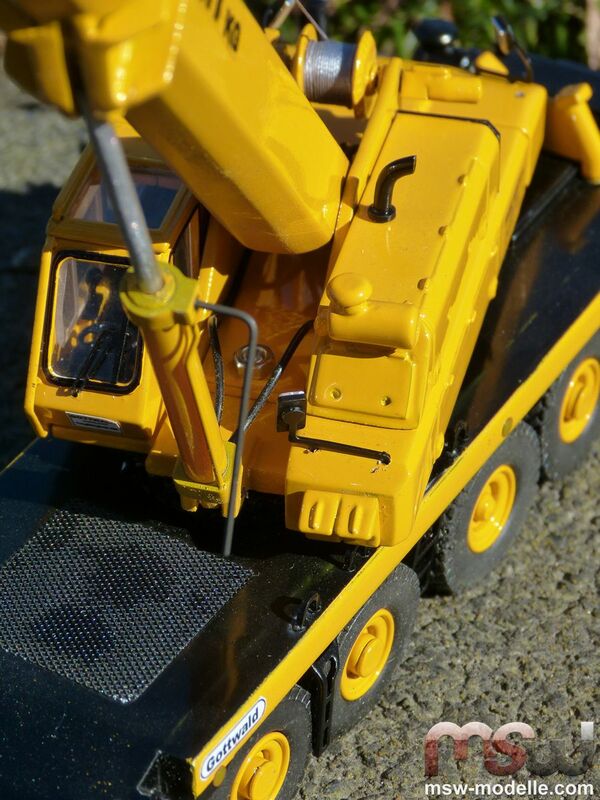 A trailer hitch and beacon lights complete the level of details. Typical feature of the Leo-range range was the characteristic twin cab, one was for lifting operations and the other one was used during travel. 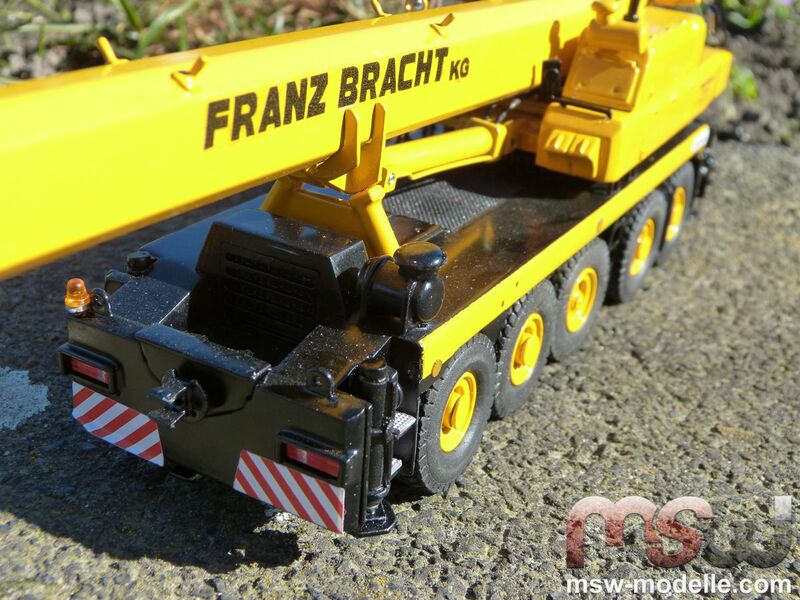 The Franz Bracht sticker with the Erwitte operations place of this company is located on the cab door. Small steps beside the outriggers would provide access to the undercarriage; which are also differentiated in silver colored material. All four stabilizers provide stability and are equipped with an internal, not visible screw thread. Warning signs on stickers are placed on all outriggers. A really great idea of Himobo is the four crane mats, which are made of real wood. 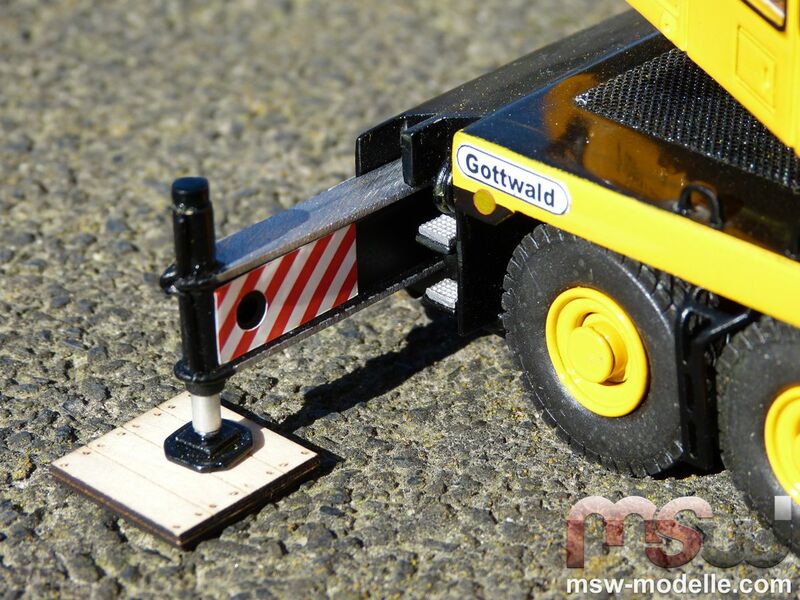 Small Gottwald stickers and handholds can be found on both carrier sides. A 107 kW Mercedes engine was installed in the superstructure. Engine cooler as well as air filters and a colored engine exhaust are easy to see. Small mirrors from the accessory bag are placed into the corresponding small holes. 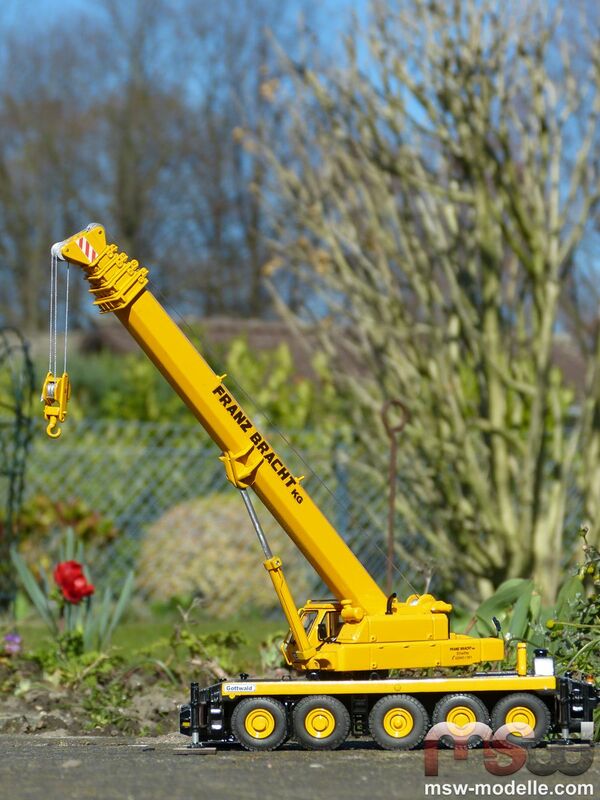 While travelling the boom rests on a yellow colored frame. 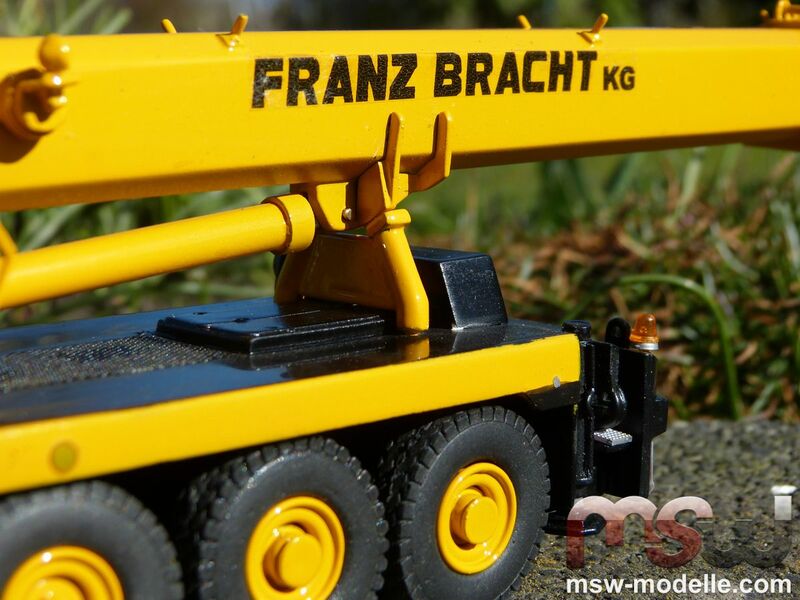 The Franz Bracht logo can be seen on both sides of the boom. Small and filigree hoses are routed to the boom lift cylinder. A typical Gottwald identifying feature was the angled boom head. Distinctive and easy recognizable from far distances, this feature was unique on cranes manufactured by this former Düsseldorf based crane manufacturer – and also really distinctive on the model. The boom consists of four extendible sections; rope-guiding pulleys are indicated on the main boom section. Small ladders including handholds are attached to the undercarriage and would ease safe access to it. The cab comes equipped of course with windscreen wipers as well as handholds and a nicely done interior. Window seals are indicated in black color, printed on the window frame. 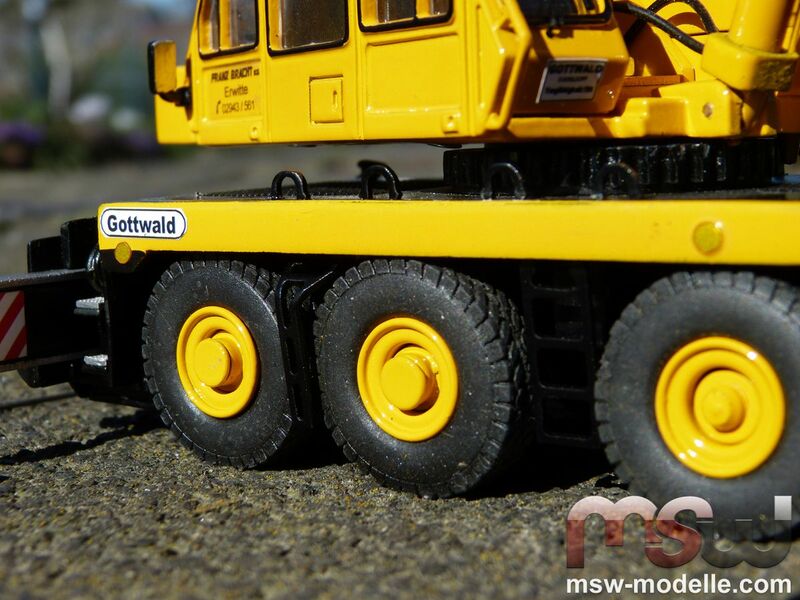 Also a nice feature is the Gottwald specification label. 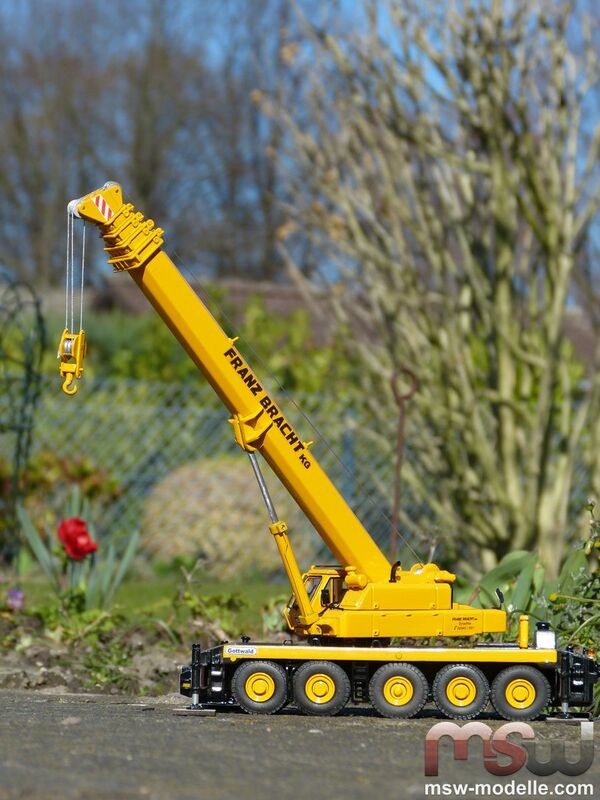 The boom is adjusted by a small cylinder; by using a small stud screw the boom can be displayed in various angles. The required socket wrench is supplied with the accessories bag. It is recommended that the screw is not adjusted often, since it might wear out. 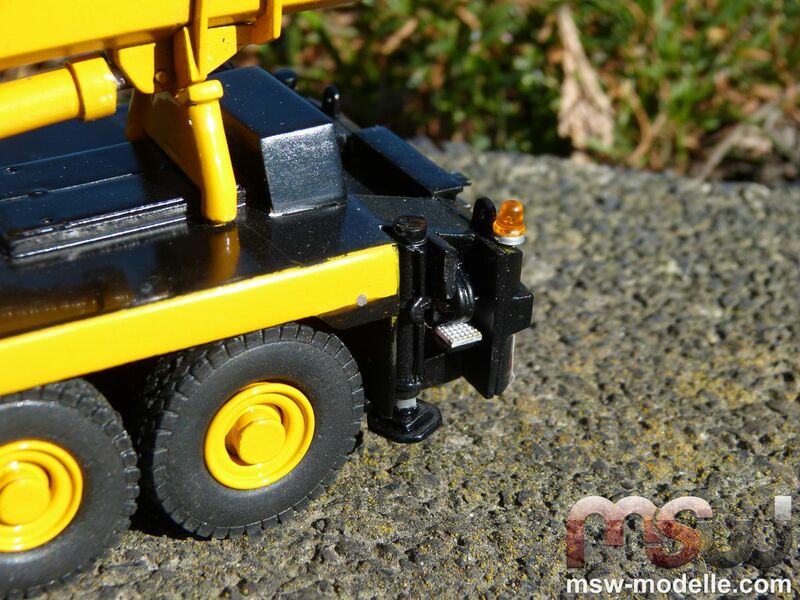 Such feature appears by the way, also on other cranes with this type of screw. The hydraulic pipe is also attached to the cylinder. However, the boom does not achieve the maximum boom angle as in reality. 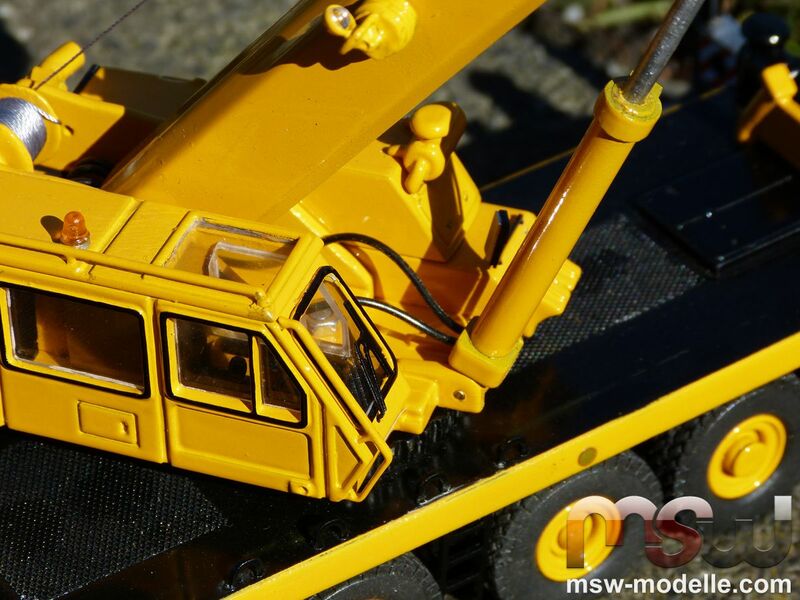 With the Gottwald AMK 71-52 Himobo created a really amazing and impressing crane model of the Leo crane range from Gottwald, providing a little insight into a really innovative crane concept of the eighties. Himobo did really a great job with functionality and details; especially without an official OEM contract and detailed original data. Also the red and black version looks really good.